August 12 2015, 3:47 p.m. 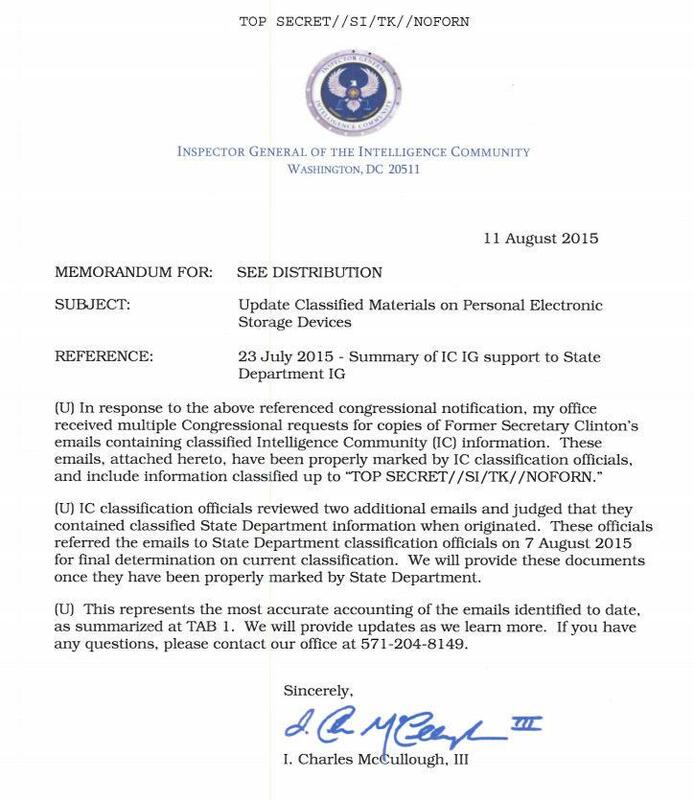 It turns out that at least two of the emails which traversed Hillary Clinton’s personal email account and server were “top secret,” according to the inspector general for the Intelligence Community as reported by McClatchy. To describe that as reckless is an understatement given that, as AP notes, “There is no evidence she used encryption to shield the emails or her personal server from foreign intelligence services or other potentially prying eyes.” The FBI has now taken possession of that server. NSA whistleblower Tom Drake, for instance, faced years in prison, and ultimately had his career destroyed, based on the Obama DOJ’s claims that he “mishandled” classified information (it included information that was not formally classified at the time but was retroactively decreed to be such). Less than two weeks ago, “a Naval reservist was convicted and sentenced for mishandling classified military materials” despite no “evidence he intended to distribute them.” Last year, a Naval officer was convicted of mishandling classified information also in the absence of any intent to distribute it. In the light of these new Clinton revelations, the very same people who spent years justifying this obsessive assault are now scampering for reasons why a huge exception should be made for the Democratic Party front-runner. Fascinatingly, one of the most vocal defenders of this Obama DOJ record of persecution has been Hillary Clinton herself. “I think that in an age where so much information is flying through cyberspace, we all have to be aware of the fact that some information which is sensitive, which does affect the security of individuals and relationships, deserves to be protected and we will continue to take necessary steps to do so,” Clinton said. That was during the time that she had covertly installed a non-government server and was using it and a personal email account to receive classified and, apparently, even top-secret information. While there’s no evidence she herself placed those documents on the server or sent them herself, it is her use of a personal server and email account that — quite predictably — caused the vulnerability. For that reason, almost all of these prosecutions for mishandling classified information have been wildly overzealous, way out of proportion to any harm they caused or could have caused, certainly out of proportion to the actual wrongdoing. But that’s an argument that Hillary Clinton never uttered in order to object as people’s lives and careers were destroyed and they were hauled off to prison. To the contrary, she more often than not defended it, using rationale that, as it turns out, condemned herself and her own behavior at least as much as those whose persecution she was defending.